If you’ve ever used a desktop database app, then you’re familiar with complexity. 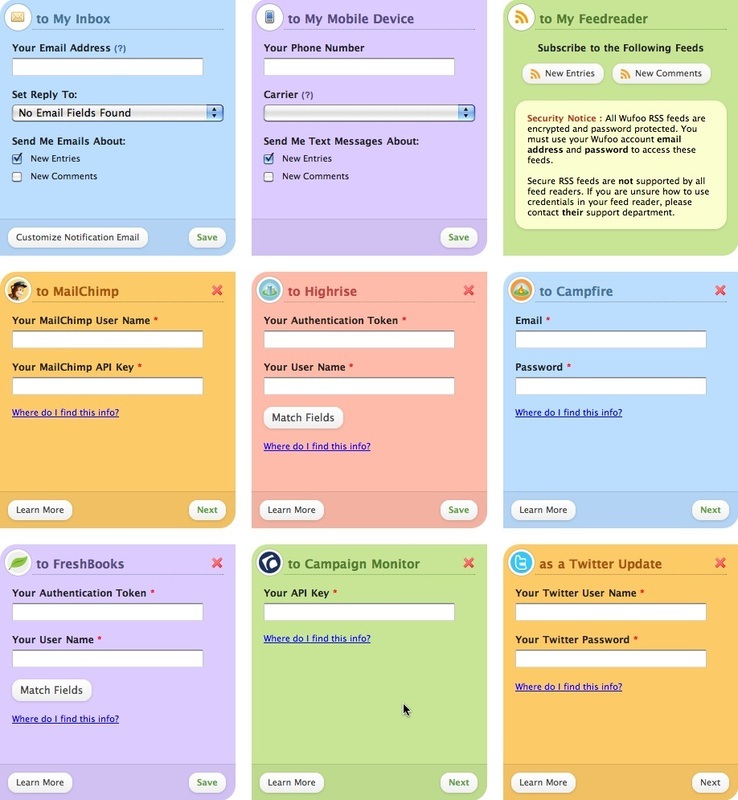 If you’ve ever hired a developer to make a form for you, then you’re familiar with delays and communication barriers. 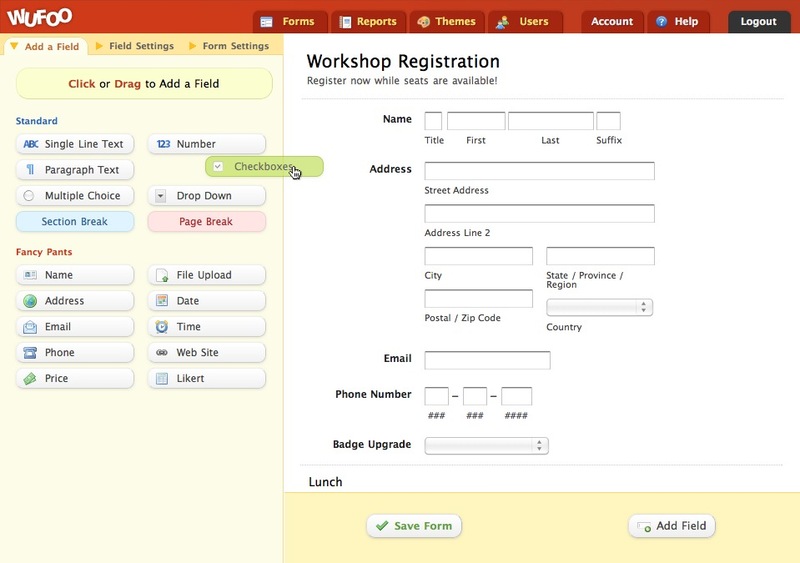 Wufoo's Form Builder provides the tools for anyone to easily drag and drop an amazing form in just a few short minutes. Whether you're a secretary or the resident IT ninja, Wufoo can help you collect data without writing a single line of code. 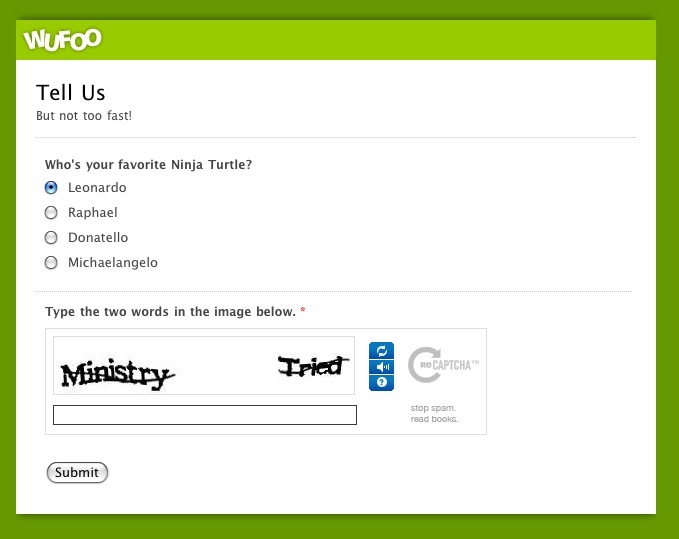 There is no point in creating forms that just do their job. 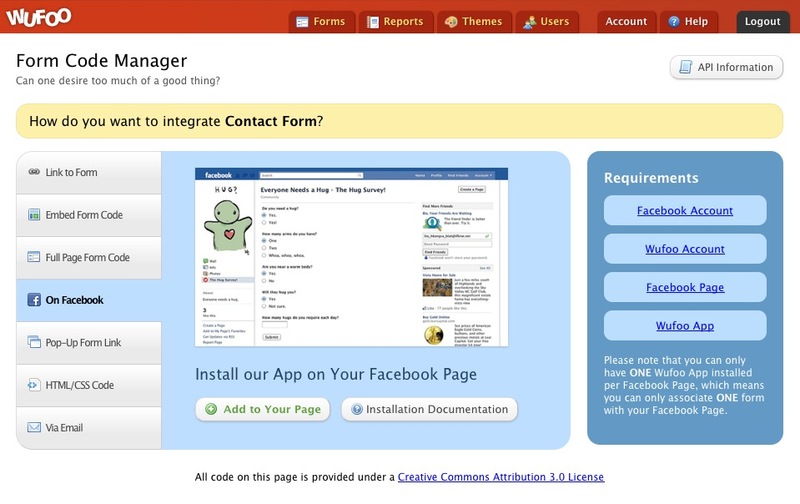 That would never be good enough.With Wufoo you can create some of the most beautiful and elegant forms on the web. The Theme Designer can help you create stunning themes to match your organization's identity and apply them to your payment forms, reports and invoices. 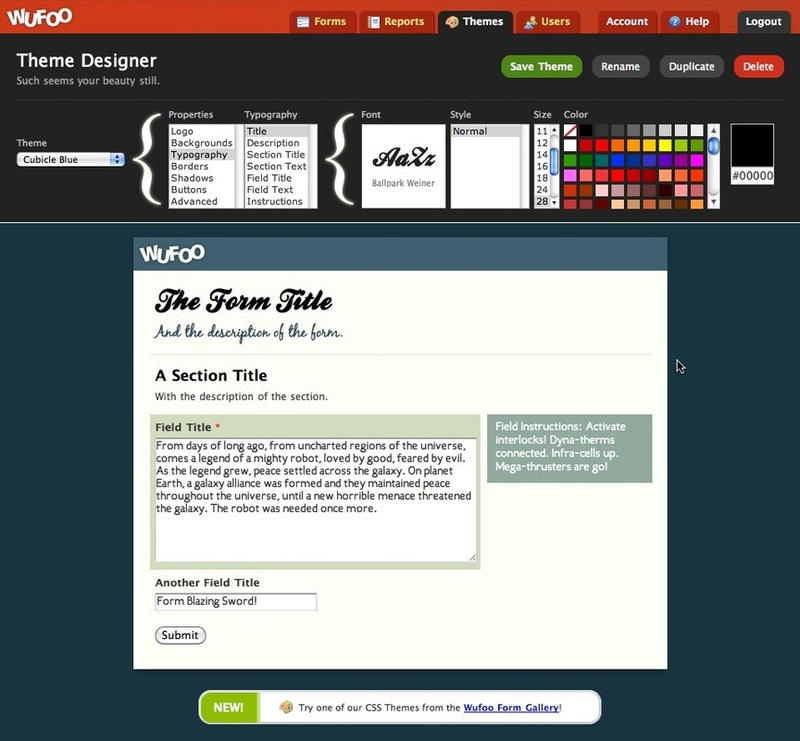 You can easily use your own logo and colors or pick a professionally designed palette from the Wufoo Theme Gallery. Wufoo's Code Manager provides a number of copy-and-paste code snippets to help you embed your form into your web site, blog post, email newsletter or Facebook page. 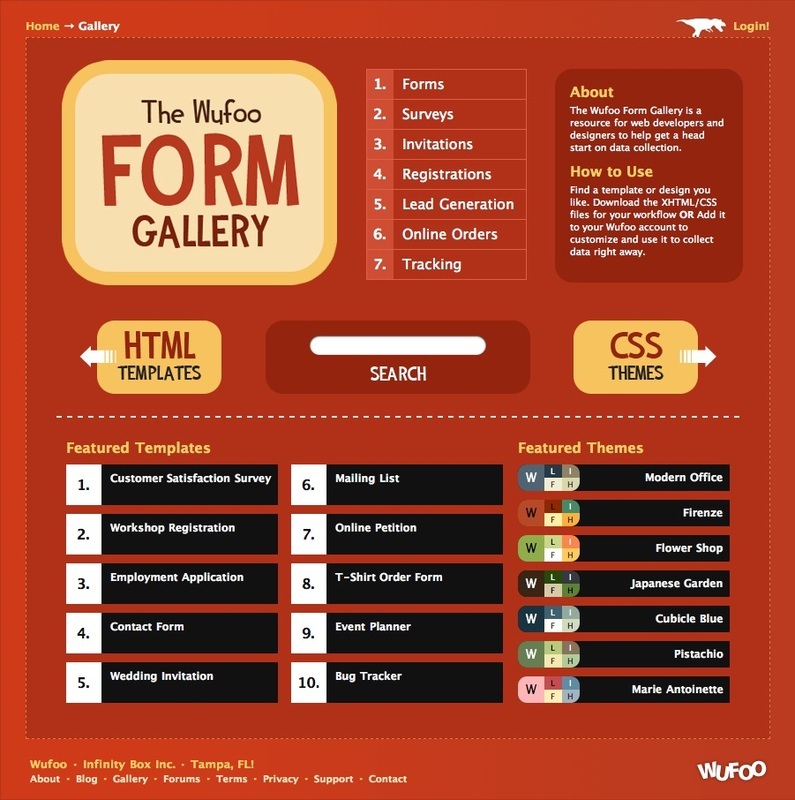 Additionally, if you want to only use Wufoo to design your forms, you can get convenient zip files of the HTML and CSS code so you can hook it up to your own database. 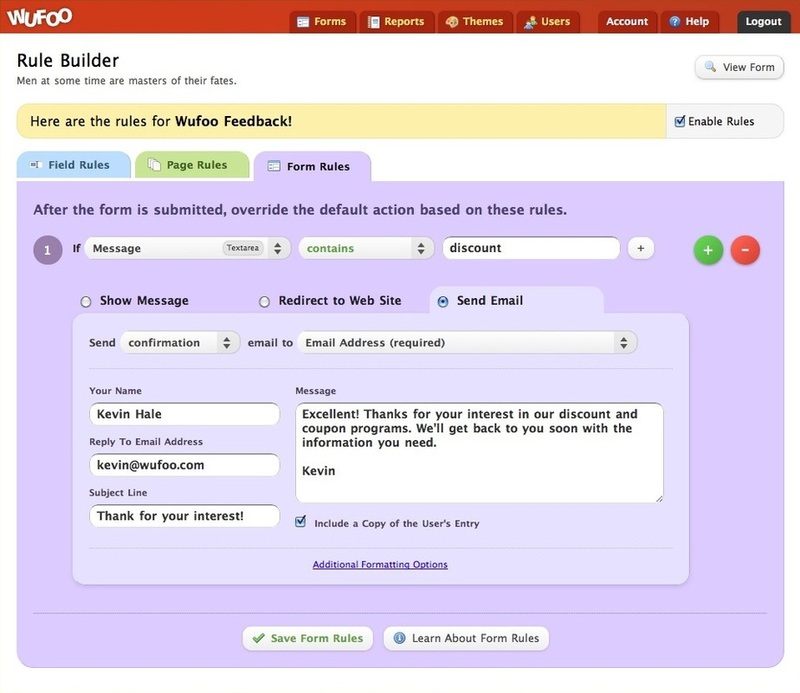 When you design a form with Wufoo, you are also automatically building the database and validation scripts needed to make sure the data you're collecting will be nice and tidy. You can make any field required and we'll take care of actions like making sure emails are properly formatted or the number of words you require are met. 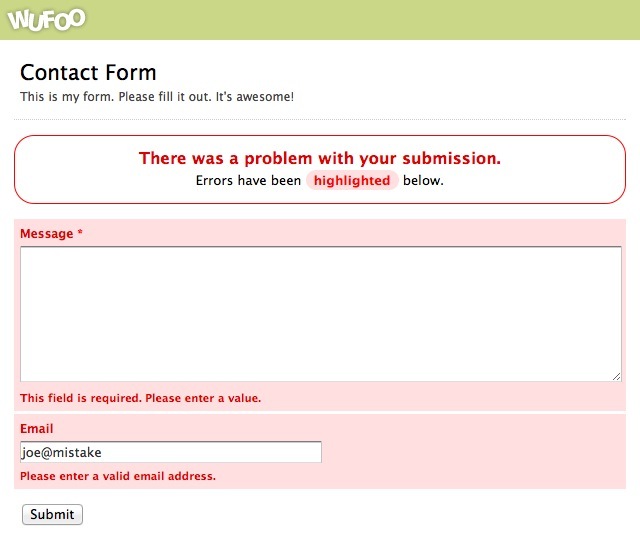 Plus, Wufoo shows all errors in easy to understand prompts to help keep your conversion rates high. Rules are really easy to understand in Wufoo. The Rule Builder was designed to make adding and understanding the logic you want to apply to your forms as easy as creating sentences. Wufoo is integrated with some of the most popular payment providers on the Internet to give you the flexibility to process credit cards with the solution of your choice. If you've got an account with PayPal, Google Checkout, Authorize.Net, USA ePay or FreshBooks you can start collecting online orders without having to fuss with complicated APIs and documentation. 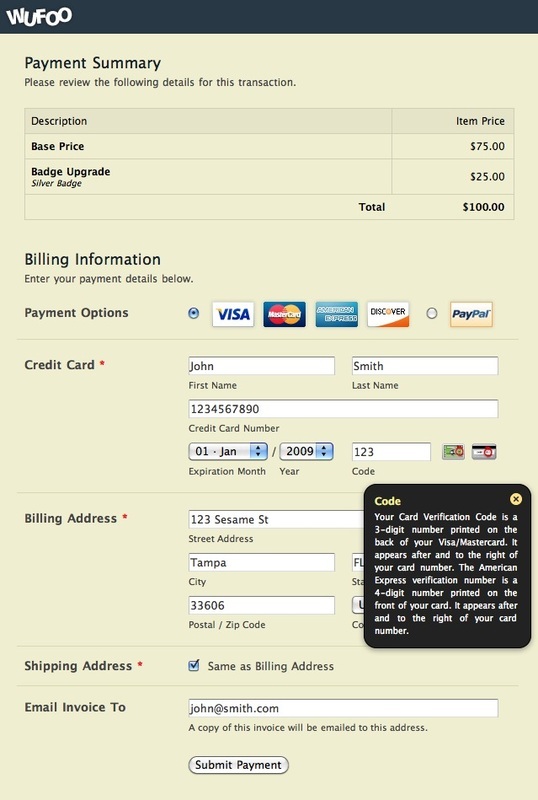 The Wufoo payment features are fairly comprehensive as well. If you need to create coupon codes, or generate custom invoices or use Chargify to handle recurring billing, Wufoo has you covered. Wufoo's payment settings interface makes it easy for anyone to start making money with a Wufoo powered form within minutes. 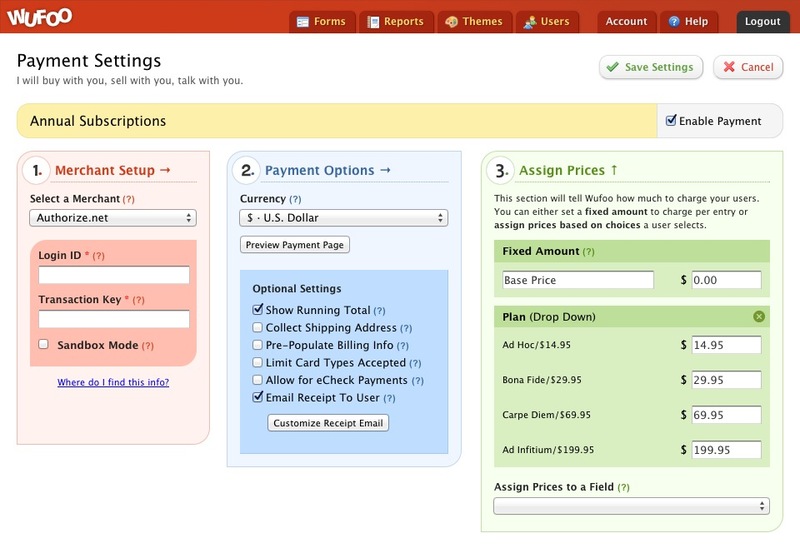 After designing your form or choosing a template from our gallery, you can quickly assign prices to the choices and selections a user makes on your form. 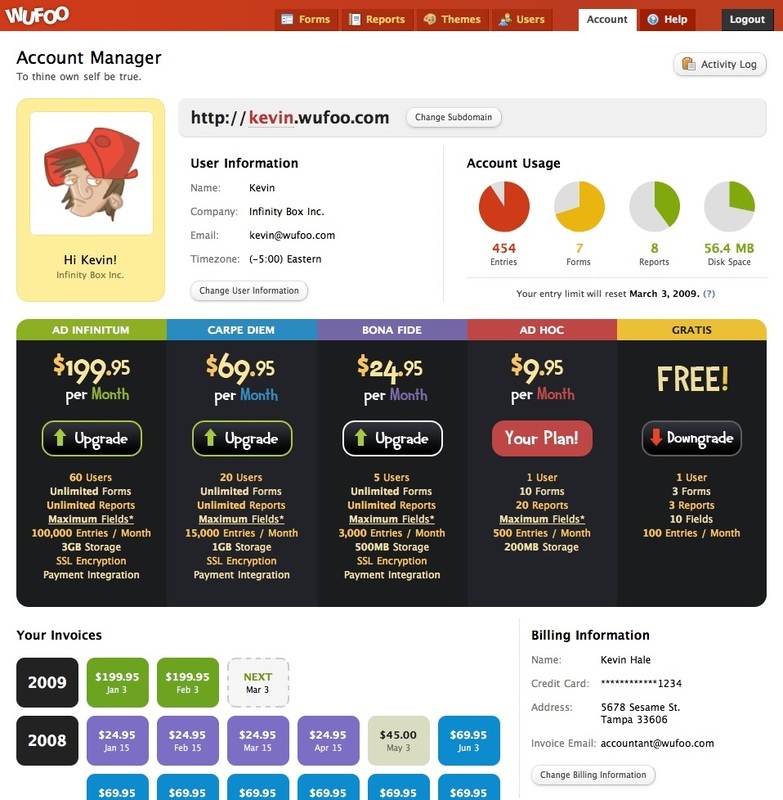 You'll be amazed how quickly Wufoo makes generating revenue with just a few simple clicks. Wufoo provides a powerful Report Builder to help you create dynamic visualizations made up of your own graphs, charts and key metrics. 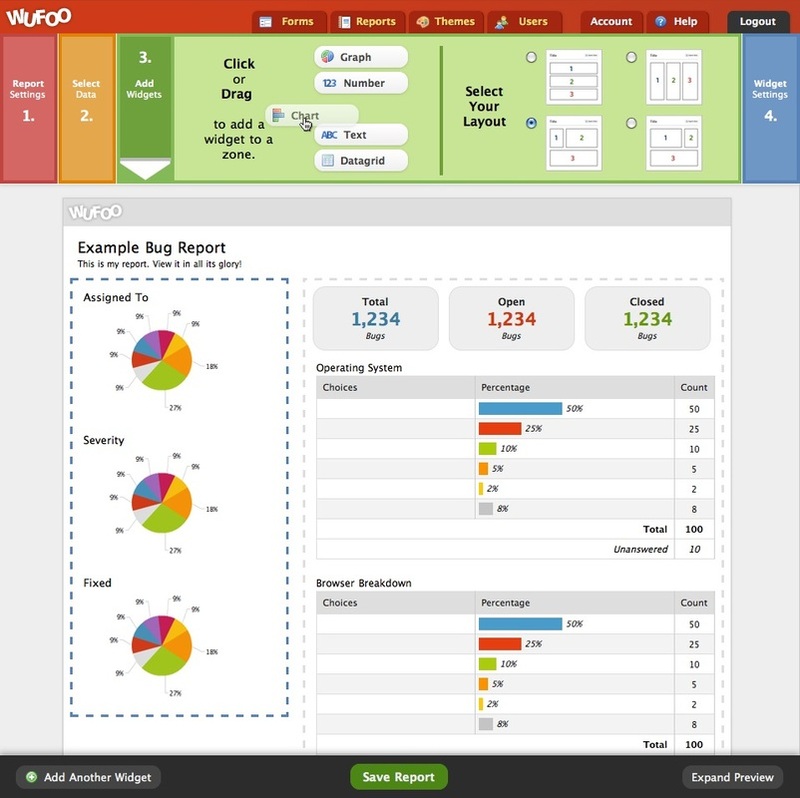 The Report Builder allows you to design your reports using 5 types of widgets (Graphs, Charts, Numbers, Text and Datagrids) that you can easily add, mix and match in your reports. If you're using the Wufoo Payment Integration features, you can easily see how your payment forms are performing by tracking their views, submissions and conversion rates. After designing your report, you can then make them public for all the world to see or password protect them for trusted eyes only. In addition to helping you collect information from your users, Wufoo also provides some really nice data on the performance of your forms as well. For every form, Wufoo provides detailed form analytics on pageviews, conversion rates, error rates and submission times to help you understand at a deep level how your forms are performing by region and platform. Additionally, since you are tracking this data over time, you can easily see how changes to your form affect your conversion rates. Information is power and with all this data collected automatically for every form, Wufoo analytics will help you be the Hulk Hogan of your organization. While Wufoo makes it easy to build most forms in a few minutes, it's often not necessary to build your form completely from scratch. 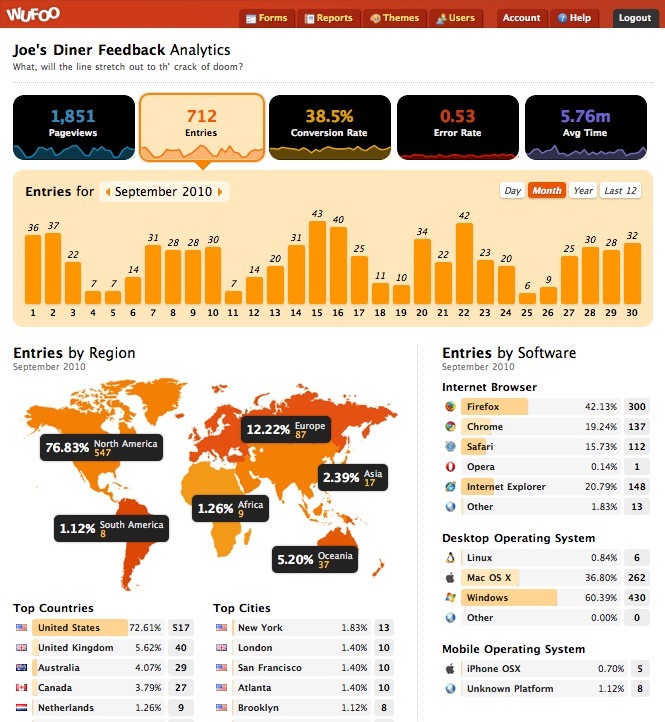 Wufoo's collection of pre-made templates and themes have been downloaded and installed over 5,000,000 times by users and developers. Also, Wufoo have developed a number of fancy colour analyzing features to make sure your graphs, tables and reports always look great regardless of the colours you've picked for your themes. So don't worry if you have trouble picking out which colours look great with maroon. Wufoo's got you covered. In an effort to balance the needs of users who want to insure the integrity of their data with the desire to promote best practices for high converting forms, Wufoo have implemented a smart captcha system that tries to automatically detect abusive behavior and only show a captcha test in those situations. Here’s a video screencast to demonstrate this feature in action. With the File Upload Field, you can have your users upload documents, photos and other media along with the other data you collect from them via your Wufoo form. This makes it really convenient to ask for screenshots on a Customer Support Form or accept resumes in PDF or Word on an Employment Application form. The possibilities are endless when you can easily accept and store files from your users. Because it's your data, Wufoo believes you have the right to take it with you. Intuitive filtering controls makes it easy to sort and filter your entries down to the essentials and if you're a statistics power user, Wufoo allows you to quickly export your collected information to Excel, CSV and Tab Delimited formats so you can import your data into your favorite spreadsheet number cruncher. 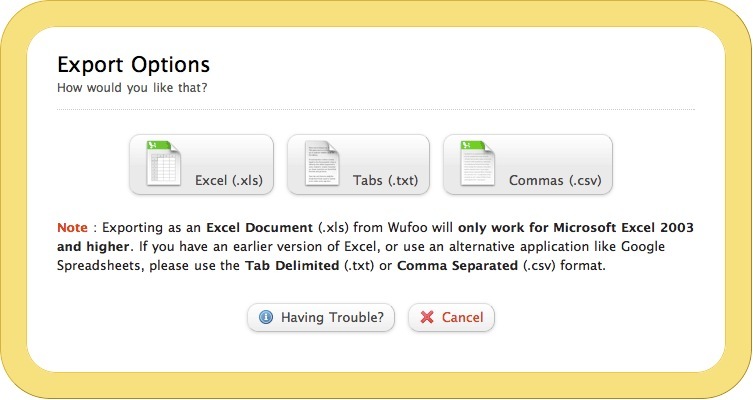 Additionally, Wufoo does everything they can to make it easy to incorporate Wufoo into your organization's workflow. From the Account Manager, you can quickly upgrade or downgrade with a single click according to your data collection needs and easily forward copies of invoices from Wufoo to your favorite billing department. Trust Wufoo, your accountants will love it. Try before you Buy. Create an account today and build 3 forms for FREE!